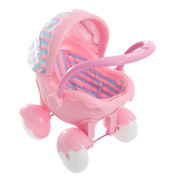 Here you will find many different forms of transport for dolls which include everything from Prams and Pushchairs to Strollers and Buggies. Available in an assortment of wonderful colours, from the red Poppy Domino to the purple Damask, they are aimed at young children wishing to role-play as parents. 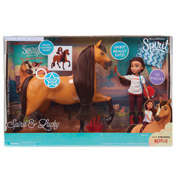 Looking just like the real thing but on a smaller scale, they are much lighter making them ideal for children to handle. From Silver Cross we have several styles including the wonderfully old fashioned, classically styled Oberon, which is one for the slightly older child, to another classic in the Ranger, a four wheeled pram with adjustable handle and co-ordinating shoulder bag. If a pushchair or buggy is what you’re after then take a look at the 3D Pushchair which has many features including reversible comfort grip handles, swivel wheels at the front and this all folds flat for easy storage. 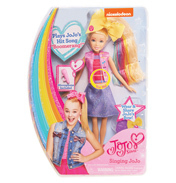 If you want to take more than one doll out then look no further than the Pop Duo Twin which has seats side by side and twin under-seat shopping baskets. 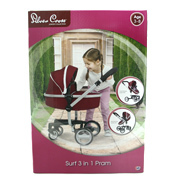 Featuring the best of both worlds is the Surf which can change from pram to pushchair with its reversible body. 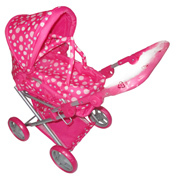 In the range from Mamas & Papas we have the traditionally styled X Cel Pram which features a sprung chassis making for a smooth ride and suiting children aged 5-10 years. Looking for something with three wheels then the 03 Sport Stroller is for you, featuring front swivel wheel and fits dolls up to 50cm. The one to take you again from pram to pushchair in this range is the Skate Combi with the easy to use tilt and reverse feature. Coming from Graco we have the 3 in 1 Travel System, this includes stroller and car seat and a handy tray for holding baby’s bottle. Also the Mirage Stroller and Deluxe Playset which will provide hours of fun for child and doll with items including a personal carrier which converts to both swing and highchair, a bouncing seat and realistic play gym. 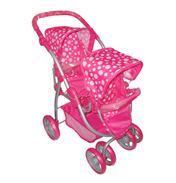 A couple of prams from Brio are the Combi Dolls Pram with removable soft carrier and the Gull Dolls Pram which is more rigid and features a folding metal chassis, foot brake and shopping basket. So all that’s left to decide is where are you going to take your dolls out to and how far to go? Even if it rains there’s no excuse as there is a rain cover available, just remember to wear your mac or take your umbrella along too! !